Copyright laws give people the exclusive right to profit from their original creative works for a specific length of time. Federal law defines the types of works that can receive copyright protection. Some aspects of furniture design are considered unique artistic endeavors protected by copyright law, just like a sculpture or an architectural plan. However, the functional or utilitarian aspect of furniture design would be covered by patent law rather than by copyright. Copyright law defines "useful articles" as those that have some function beyond their style or appearance, such as clothes, appliances and furniture. Original, creative designs of an artistic or imaginative nature incorporated into utilitarian objects can be protected by copyright law, but the underlying functional design of the object itself cannot be. A painted design or a bas-relief carving on the back of a chair is within the purview of copyright protection, but the fundamental practical design of a chair cannot be copyrighted. Copyright law does cover sculpture so, to the extent that a piece of furniture may constitute a unique sculptural configuration distinct from its useful function as a table or set of shelves, that sculptural aspect can be copyrighted. Some functional aspects of furniture design may qualify for patent protection rather than copyright. Copyright protection springs into being when an original, creative idea is fixed in a tangible medium. In regard to the copyrightable elements of furniture design, this does not necessarily mean that the item must be constructed before copyright attaches. Sketching the intended copyrightable design or element on a piece of paper or drawing it in a digital design program, places it into a fixed medium for purposes of copyright protection. Copyright law helps ensure that creative people can make a living from their original works by giving a copyright holder the exclusive right to reproduce and distribute her works for a period of time -- usually the life of the copyright holder plus 70 years for most works created after 1978. This means that a furniture designer has the exclusive right to produce and market her furniture designs that contain copyrightable elements. A copyright holder can also profit from her copyright by selling the right to reproduce and market her copyright designs to another person. Copyright protection extends to derivative works, or variations and enhancements of the original copyrighted design. Copyright protection starts automatically once a design is fixed in a tangible medium, without any need to file paperwork to register the copyright. However, registering a copyright with the U.S. Copyright office conveys distinct advantages. Registering the copyright helps put the world on notice that the design is copyrighted and of the identity of the copyright holder. A copyright holder cannot bring a lawsuit against someone for infringement of her copyright unless the copyright has been registered. Registered copyrights can also be recorded with the U.S. Customs Service, which helps protect against importation of items that constitute copyright infringement, such as cheap knock-off furniture that exploits copyright-protected design elements. If the copyright is registered promptly after the design is created, the copyright holder has the additional advantage of being entitled to statutory damages and attorneys' fees if she prevails in a copyright infringement lawsuit. 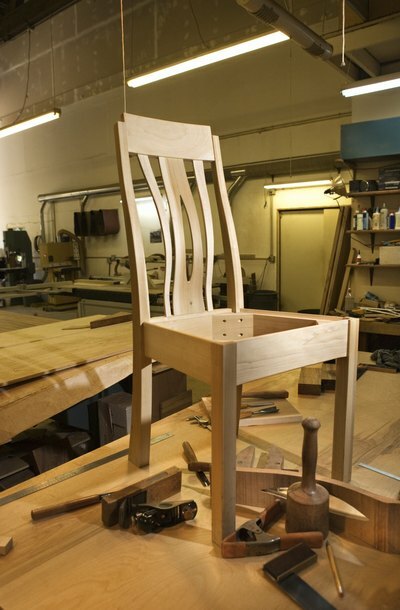 Because actual damages for copyright infringement are often difficult to quantify, the damages specified by statute -- up to $150,000 for a willful violation -- can be of particular help to artisan furniture makers seeking to protect their copyrights. Can I Make Items Using Copyrighted Fabric? Sewing and crafting enthusiasts who purchase fabric by the yard are no doubt familiar with copyright markings. Fabric manufacturers imprint many textiles with the copyright symbol on the selvage edge of the fabric along with the manufacturer's name to put the world on notice that their designs are protected by U.S. copyright law. These symbols can be confusing when someone wants to make -- and perhaps sell -- items using copyrighted fabric. Walt Disney and the Disney group of companies have created some of the most memorable fictional characters in contemporary culture. Twenty-first century characters such as Nemo the clownfish are as beloved as classic characters such as Mickey Mouse and Donald Duck. Individuals who wish to use the Disney characters should take care to make legal use of them to avoid infringing Disney's intellectual property rights.